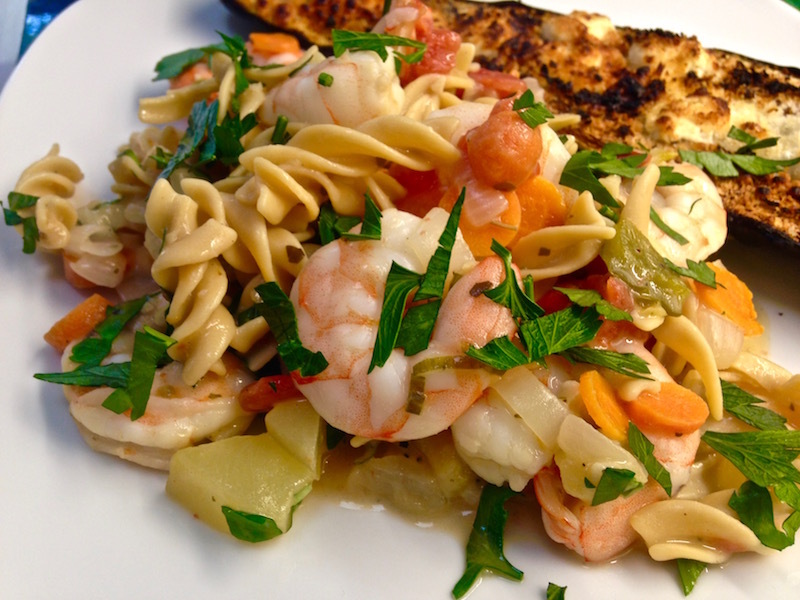 Shrimp Primavera a la David + My Interview on Half Size Me! | Keep It Up, David! 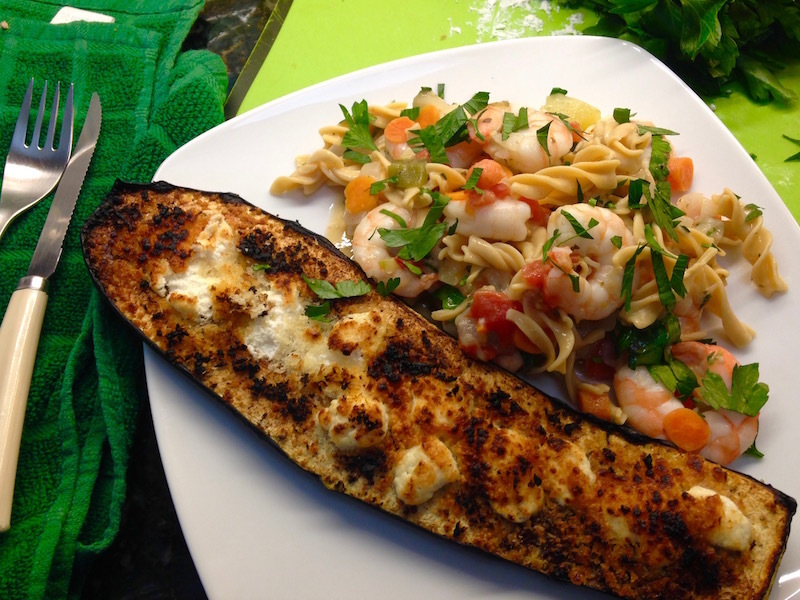 Shrimp Primavera a la David + My Interview on Half Size Me! 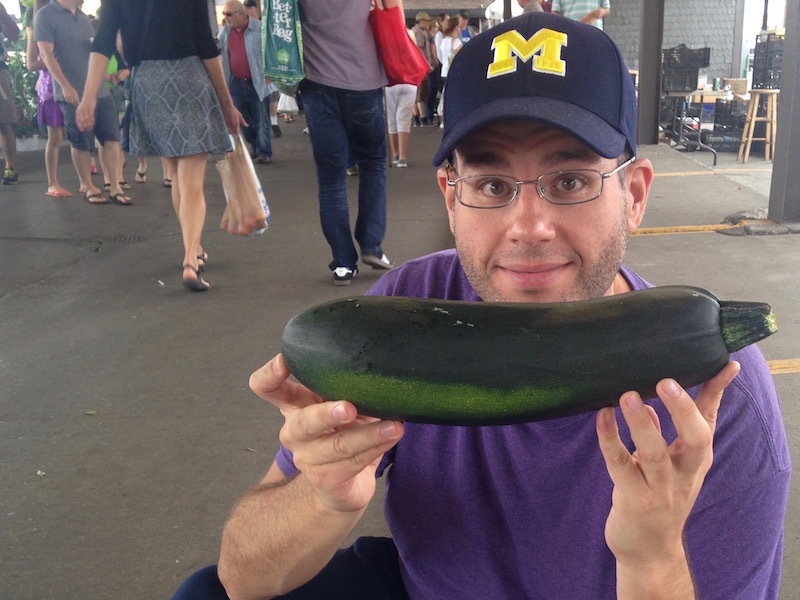 Remember all those awesome veggies I bought at Eastern Market? I put many of them to good use in a healthy, lower-carb version of an Italian favorite. I’m sharing the recipe in this post… plus a bonus side dish recipe! The podcast is 42 minutes long, and you can listen to it here. And if you’re here because you learned about me from the podcast, WELCOME! Glad you stopped by and I hope you take a look around! Heat one tablespoon olive oil in a big skillet. When it’s hot, add 1.5 teaspoons of chopped garlic. After a minute or so, add in all sorts of veggies. Primavera typically has spring veggies, like asparagus and mushrooms, but I used veggies I had on hand, and the new stuff I got at the farmers market. about 1 cup of chopped zucchini. 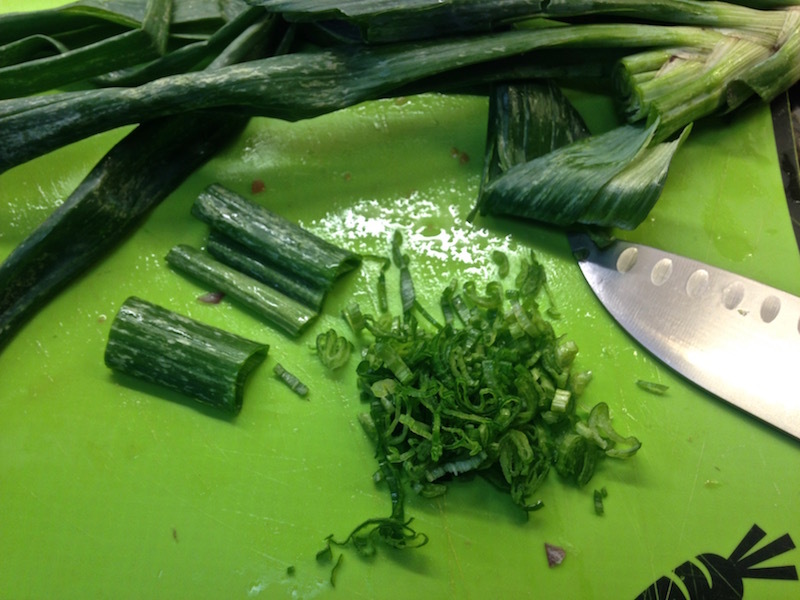 I also added a couple tablespoons of the green stems from the spring onion. They’re basically mature scallions. Oh, and I added some salt and pepper. I let that all cook for about 10 minutes, until everything got soft and tender. Then I got to work making a sauce, in the same skillet. First I dissolved 2 tablespoons of flour in about 4 tablespoons water. This will thicken the sauce, and you dissolve the flour first so it doesn’t get lumpy. RELATED CONTENT: Dozens of Healthy Recipes on my RECIPES page! After adding that to the skillet, I added 1 cup chicken stock and 2/3 cup 1% milk (use whatever milk to have). You can also add about 1/2 cup of Parmesan cheese, which I was planning to do, but I forgot. It’ll be pretty liquidy, so let it simmer, over low heat, to reduce and thicken. This may take 15-20 minutes. While this is happening, cook your pasta. 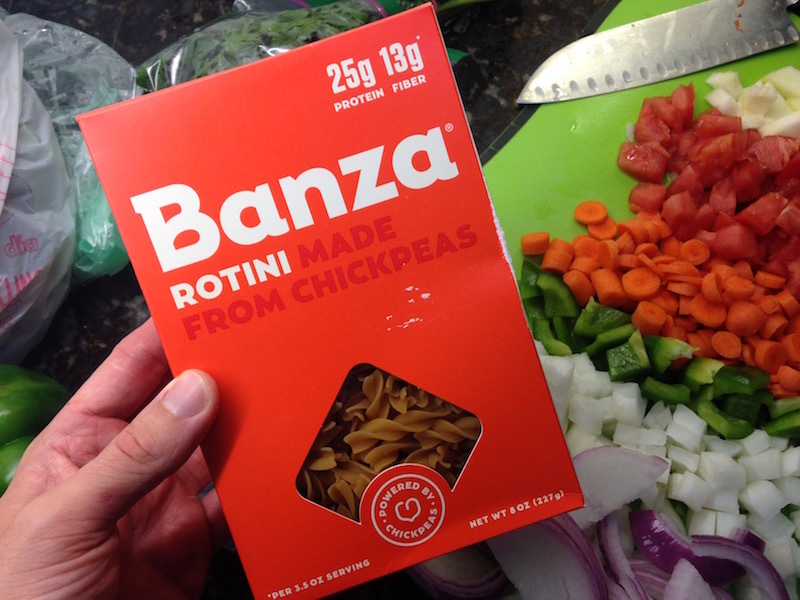 Banza is a Detroit-based company that makes chickpea flour pasta. Like the edamame pasta I mentioned in this post, chickpea flour pasta has about 1/2 the carbs and 3x the protein as regular pasta. Simply put, it’s better for you. I cooked an entire 8-ounce box of Banza rotini. When the sauce is pretty thick, add the shrimp. I used a 2-pound bag of tail-on shrimp, although my mom pulled the tails off first. I just nestled the shrimp on top in a single layer, then covered the skillet, and they cooked in a couple minutes. When the shrimp was done, I combined the shrimp/veggie/sauce skillet with the pasta in a big serving bowl, garnished it with a couple tablespoons of fresh, chopped basil and parsley, and that’s it! How does it look? 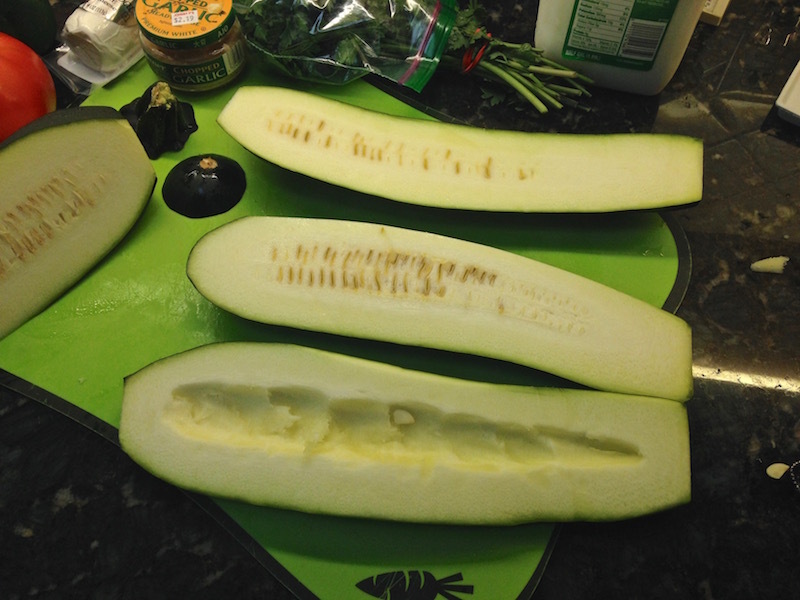 I cut three long slices off the zucchini, then scooped out the seeds, leaving a little trench in the middle. 1/2 cup Panko bread crumbs, divided between all three. 1 tablespoon olive oil, divided between all three. RELATED CONTENT: Check out my Rosemary Ginger Zucchini Boats recipe! I popped them under the broiler for 2 minutes to brown the crumbs, and that was that! Together, they made for a delicious dinner. The pasta was creamy and full of flavor, and the zucchini crusty and tender. Here’s the best part – the calorie count! This recipe makes a LOT of primavera, and 1/8 of the finished product (roughly what I served myself on that plate) was only 261 calories. 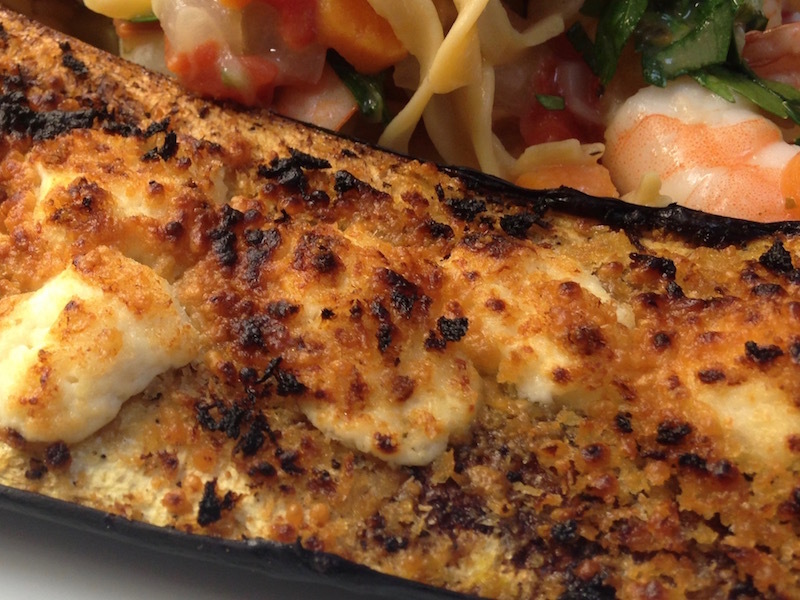 The zucchini boat was another 266 calories, so that entire plate only had 527 calories! This entry was posted on Monday, August 1st, 2016 at 8:53 pm and is filed under Uncategorized. You can follow any responses to this entry through the RSS 2.0 feed. You can leave a response, or trackback from your own site. 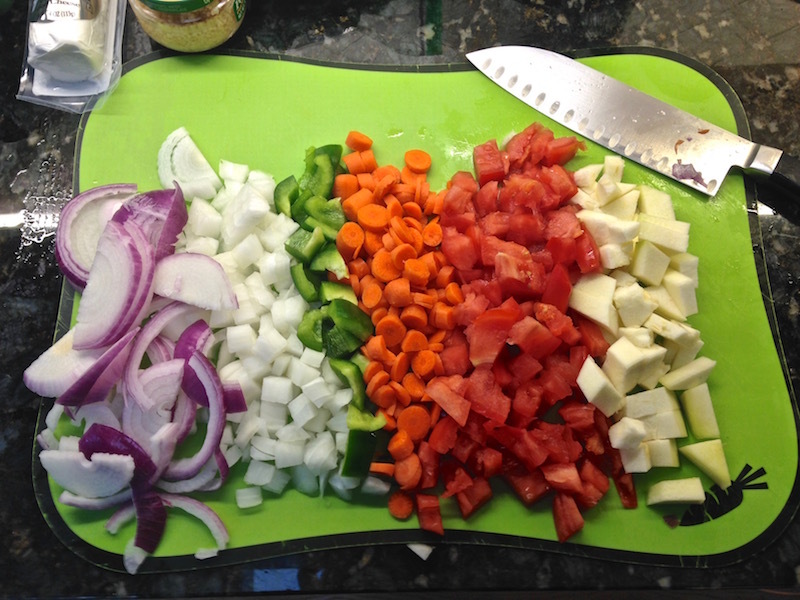 6 Responses to Shrimp Primavera a la David + My Interview on Half Size Me! I heard your interview on Half Size Me and it was AMAZING! I teared up more than once. You are so inspirational! I have been on a “secret” weight loss journey too, I like it that way, since as you said it’s my body, my business. Congrats on your weight loss and transformation! I can’t wait to have the same successes you have. I don’t have as much to lose but we are all on the same journey and go through the same struggles. You are truly inspirational! I wish you had your own podcast! So lucky to have heard your interview. This made my day, Samantha. Thank you for listening, seeking me out, and sending such kind words. I wish you success as you move forward, and congratulate you on the steps you’ve taken so far. KEEP IT UP! I listened to your podcast yesterday and I think it has to be one of my favorites so far. Some of the things you said really stuck with me and I love how you described the reasoning behind “Keep it up.” And you got to work with Richard Simmons, how cool is that? Keep it up? I think I will! Wow – thank you for reaching out… and with such nice things to say. Welcome to my site – hope you enjoy, and I hope you DO keep it up There’s always *something* to celebrate to help push you forward, so… KEEP IT UP!